We don't have to go far to have a splendid day on the water in our boats. But it's a treat to go farther afield, whether in person or vicariously. This year club members shared stories of trips to Cumberland Island, GA, southeastern Alaska, the Lofoten Islands in Norway, Voyageurs National Park, and Yellowstone National Park. 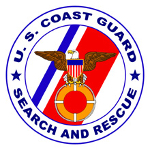 Judy Julian, former Search and Rescue trainer in the US Coast Guard Auxiliary, presented this program on how the SAR system works, and what we can do to stay out of trouble and increase the likelihood of being found if we do need help. Peggy O'Neal organized a couple of weekend trash pickup paddles on the Mississippi River. We collected as much trash as we could paddling from Hidden Falls to Harriet Island, emptied our bags, and then filled up again going north. We came up with "swarm" and "leapfrog" strategies, and hope to do more of this next year. Joan, Sharell, Mike W, Fred, Bernie, and Tony S joined in. Photos are here. Decisions have to be made when we're paddling. Peggy O'Neal took up the baton from Lisa Dau and led a program on group decision making. Club members shared past experience on different approaches. Agreeing in advance on how the group will make decisions can make a trip easier as well as safer. Peggy O'Neal and Fred Linehan led a pair of day trips in Duluth. Sharell, David D, Bernie, Larry S, Lisa, and Tony S joined in on Saturday to launch from under the Blatnik Bridge and paddle up the St. Louis River past Clough Island and back. On Sunday, Peggy, Fred, Sharell and Bernie launched from Minnesota Point and paddled out under the lift bridge and north along the city's waterfront. Photos here. 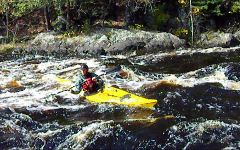 The Fall Rendezvous was attended by 4 recent members of ISK and one old timer, and they were joined by a local kayaker. The group paddled along the Minnesota side of Lake Pepin, exploring the Lake City waterfront and Marina. Lunch was on the sandbar by the Sportsman’s Club. A southwest wind at their backs helped the return to camp. Michelle and Jeff Forseth organized and led a trip to the North Shore, camping at Gooseberry Falls. Saturday's paddle was Gooseberry Falls north. 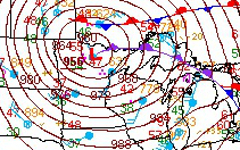 Building winds resulted in the trip being cut short at Little Two Harbors. Sunday's paddle launched from Silver Bay, paddled to Palisade Head and returned. Photos here. Lisa Dau led this lovely fall trip on the St. Croix, joined by Peggy, Bernie, Peter L, Kevin J, Mike W and Sharell. The group launched from Boomsite and paddled up to the historic Arcola Bridge, where Lisa managed to find herself a new bowling ball. No trains crossed the bridge this year while the group was there, for which Mike W. is being held accountable. 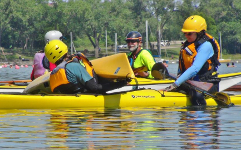 This class offered by Jeff and Michelle Forseth builds on the skills learned in Where Water Meets Land Level 1, Strokes and Maneuvers Applied, and Rescues by taking them to a more active environment. The group camped in Little Sand Bay on the edge of the Apostle Islands and did day paddles in the area, looking for what the lake had to offer. Michelle Forseth and Peggy O'Neal led a discussion of why we use VHF radios and things to consider when selecting one. We practiced Mayday, Pan Pan, and Securite calls. Meredith brought a radio with DSC capabilities and we discussed the benefits of broadcasting your position with an emergency call. More information is here and here. Peggy O'Neal and Katie Katzner led two day paddles in on the Mississippi River. The group stayed at a campground in Winona, MN, a historic river town that is well worth spending more time exploring. On Saturday, Peggy, Katie and Terry K paddled up the sloughs. Sue G joined in on Sunday to explore the mysterious Paddlefish and Turtle Islands, then head out into the main river channel for a while. Dana Dickson organized this kayaking trip to Yellowstone Park. He and Lisa D kayaked past the West Thumb Geyser Field on Yellowstone Lake, then paddled from Lewis Lake to spend 4 days on Shoshone Lake. The weather was excellent, with a high pressure system stalled over the park. One day included a hike from Bluff Top to the undeveloped Shoshone Geyser Field. Bernie Graham and Peggy O'Neal led a pair of day trips in the Bayfield area, based out of Little Sand Bay's campground. On Saturday, Peter and Gail R, Nick H, Lisa and Stephanie J launched from Meyers Beach, paddled the mainland sea caves and out to Eagle, then back to the beach. On Sunday, a smaller group paddled from Friendly Valley south to Houghton Point and back, including a side trip up the Sioux River. Jeff and Michelle Forseth once again coordinated bringing BCU Level 5 Coach John Carmody to Bayfield to offer a 3 day BCU 3 Star and 3 Star Plus training weekend. Joan Kline, Peter Lindell, Patrice Brousard, Mary Linville, and Meredith Cummings earned their 3 star awards. Lynette Woida organized another splendid picnic with the help of Joan Kline. Fred Linehan wrangled another splendid rodeo, and even brought a couple of stand up paddle boards for people to try. Good food, good company, and good fun, though we're always aware that picnic time means that the summer is starting to wind down. Taught by Jeff Forseth and Peggy O'Neal, this class challenges students to apply skills they've learned in a "practice" context to more real world scenarios. Sam Grubisich led a pair of day trips on Lake Minnetonka. They launched from Surfside Park on Cook's Bay and paddled thru Emerald Lake, the West Arm, Crystal Bay, under Coffee Bridge, into Smith Bay, around Hunting Point, thru the Narrows, past Spray Island, thru Zimmerman's Pass, and back to the beach. Lots to do on our biggest local lake! Connie V and Becky H organized a four day trip in Voyageurs National Park. Joined by Stace L., Sam R., and Terri K., they launched from the Ash River Visitors Center and base camped on Kubel Island on Namakan Lake for 3 nights. 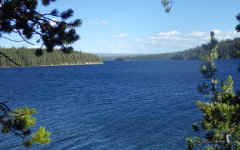 Side trips to explore the history of the area included stops at Kettle Falls Hotel, I. W. Stevens Pine Cove Resort, and Hoist Bay. Peggy O'Neal and Michelle and Jeff Forseth led this one day rescues class on Lake Calhoun. Participants worked on tuning up T rescues, towing, swimmer rescues, and more. Photos are here. Jeff and Michelle Forseth offered this three day introductory class to rock gardening and a combination of journeys and skills development based out of Grand Marais, MN. It's a fun way to build confidence where the water seems to be more active. Two Strokes and Maneuvers Refinement classes were offered this year, one taught by Jeff and Michelle Forseth and one by Jeff Forseth and Katie Katzner. The classes focus developing on ease and effectiveness in forward, backwards and sideways strokes as well as turning. Trip leaders Dan Morrison and Tim Manning organized this 3 night/4 day trip to the Oak Island group campsite in the Apostle Islands. Herb, Clarence, Dan H, Colin M. and Dennis V N joined the group. They stopped by Raspberry Island Lighthouse for one of the first tours of the season. A bit of rain on Day 2 was handled with ease. Trip report is here. Jeff Forseth and Ryan Rushton co-led a trip to Southeast Alaska’s rugged Yakobi Island for a week of training and journeying in the Alaskan wilderness. Michelle and Jeff organized awesome meals. Fred, Bernie, Sharell, Mike W, Becky H, Katie, and Aaron made up the rest of the gang. Read more in this shared shared write up, and check out photos here. Dan O'Neal was the big winner this year's Garage Sale, going home with Jeff Forseth's NDK Explorer. 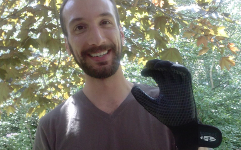 Plus, as seen in the picture, he won the coveted Michael Jackson Memorial Sea Kayaking Glove, which recognizes the event's biggest spender. If you weren't there in 2015, you should be crying bitter tears and clearing your calendar for 2016. Fran Lesicko organized a series of Full Moon paddles over the summer. 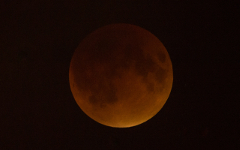 We had a chance to see the Srawberry Moon, a Blue Moon, the Sturgeon Moon, and the Harvest Moon, which came along with an eclipse in September. ISK club members had a chance to work with Ryan Rushton on a fun and challenging course that introduces and improves sea kayak handling in currents. The class was held on the Menominee River in Wisconsin. Sue G, Bernie, Becky, Aaron, Katie, Aras, Fred, and Tony W joined in. Bernie's trip report is here. This 3 day event held on Lake Independence started as a collaboration among Christopher Crowhurst and Lynette and Mike Woida. Cindy, Pete K and Renee were soon involved. Many others assisted and mentored. Participants had opportunities to explore numerous aspects of qajaq culture, including qajaq building, Innuit games and rope gymnastics, hunting techniques, rolls, and more. Read more here. 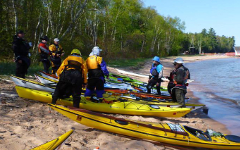 Club members gathered at Little Sand Bay over Memorial Day weekend for two days of paddling on Lake Superior. 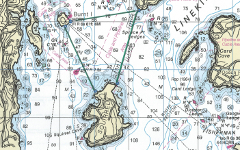 There were three options for group paddles each day, including the mainland sea caves, Sand Island, and Long Island. The group campsite and a pot luck Saturday night gave people a chance to socialize and make new friends. Photos: Joyce Day 1 and Day 2, Mike W Day 1 and Day 2. 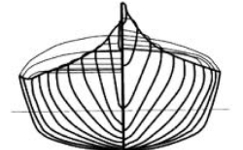 Sam Grubisich drew on his many years as a kayaker and his retail experience helping people select their first boat to provide an overview of boat design, features, and trade offs. Michelle Forseth and Tony Schmitz again taught this intro class on Shady Oak Lake. 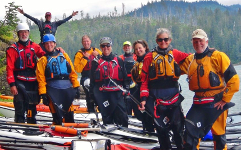 This is a great class for club members just starting out, and it's a great class for friends and family who we want to get started with a sound paddling foundation. This year it happened. Linda Pascoe led this trip looking for spring wildflowers and nesting birds on the St. Croix River. Joyce, Deb and David S, Dana, and Tom O joined in. Joyce's photos are here. Peggy O'Neal and Jeff and Michelle Forseth led an on water practice day for participants in the Inland and Coastal Waters Navigation classes. 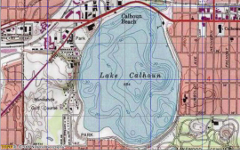 It took 3 tries to locate a venue that worked, but participants managed to find challenges navigating the wilds of Lake Calhoun. What do you do if there's an injury or illness and EMS is not 10 minutes away? How do you manage care for someone for an extended period of time? Can you stay and play with an injury or is it time to go? Tom O'Neal once again offered a 2 day Wilderness First Aid course to club members. Kenny Blumenfeld is a weather research analyst with Hennepin County Emergency Management. He returned to share his weather knowledge and some basic "survival forecasting" that he includes when teaching meteorology courses. This event helps us find out how prepared we are to respond to a variety of challenges that could come up on an extended day trip: navigation, first aid, communications, towing, group dynamics and other topics. Jeff and Michelle Forseth have organized this event since 2007. Jeff, Michelle, and Peggy were this year's observers. Nearly everyone gathered at the Forseth's home after the event for soup and a debrief. Photos here. Our cold water immersion event allows us to experience capsizing in cold water in a controlled and supportive environment. We also have an opportunity to practice rescues and test our gear in cold water, seeing what works and what we want to improve on. Photos here. Jeff and Michelle Forseth led a trip to Cumberland Island, GA. Joined by Deb and David S, Fred, Mike W, Katie and Aaron, they paddled across the Intracoastal Waterway to reach Cumberland. They spent a few days enjoying this beautiful barrier island with beaches, live oaks and Spanish moss, wild horses, dolphins, historic ruins, and even armadillos. Photos here. At the annual meeting we elected the new board of directors: Katie Katzner (President), Fred Linehan (Treasurer), Jeff Forseth (On Water Education), Becky Hoye (Secretary), Aaron Katzner (On Land Education), Connie Vandergon (Trips). Many thanks to Sharell Benson and Sam Grubisich, who stepped down after serving on the board for several years. Tony Schmitz and Sam Grubisich provided dueling approaches for what seems like a simple question: What are you going to wear today? Ask 6 kayakers and you'll get 7 answers. Safety and comfort factor into our choices, as well as cost. And of course that innate fashion sense that sets kayakers apart from the rest of the crowd. Building on the skills taught in Inland Waters Navigation, the Coastal Waters Navigation class taught by Peggy O'Neal and Michelle and Jeff Forseth added tides, currents, and magnetic variation into the mix, providing real world planning exercises in a variety of places we might like to paddle one day. Jeff and Michelle Forseth and Peggy O'Neal split the navigation class taught in prior years into two separate classes. 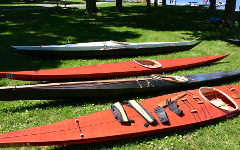 Inland Waters Navigation is designed for kayakers whose main venues are inland lakes and rivers of the Midwest, which, among other things, is a charmed land of nearly zero magnetic variation. Sam Grubisich led this month's program about how to pack our boats. How does all that gear fit? What should be near you and what comes out of the hatch first? How does weight play into the packing plan, and what about that thing I heard about iron and compasses? The Event Planning Party is a chance for kayaking-deprived club members to gather, share some food, swap some gear, and talk and think about what we want to do in the coming year. Dana Dickson helped us rent the Isaak Walton house again, which is always much appreciated. Taking advantage of having the Isaak Walton house for the day, Fred Linehan provided CPR and First Aid training to a class of twelve ISK members. Infant CPR was a highlight of this year's class. We have fun learning and practicing CPR and First Aid in the context of kayaking, but we never know when we will need to use these skills in real life. Photos.